CAN PRECANCEROUS LESIONS LEAD TO SKIN CANCER? Most often we do not take any spot or discolouration on our skin very seriously, thinking that it may go away. Sometimes you notice a spot on the arm or leg that was not there before and head to your dermatologist to find out what it is. After examining the spot, the doctor may tell you that it is a precancerous lesion. What does that mean? It is serious and it means that after some time it can develop into cancer. It means you should immediately start treatment or does all these means that you need not do anything about it. 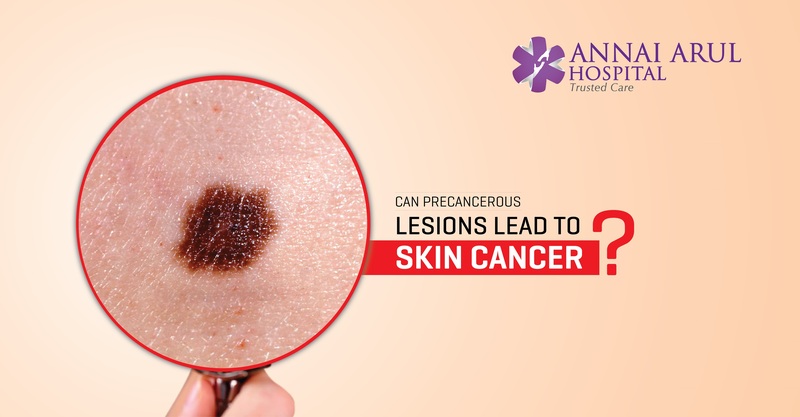 According to medical experts, a precancerous lesion is a change in some areas of the skin that always carries a risk of turning into skin cancer. It is a preliminary state of cancer and requires all our attention and treatment. Although not all precancerous lesions will ultimately turn into cancer, many doctors treat these lesions as a preventive step. The lesion may be removed with minor surgery before it has a chance to turn into cancer. What are the common types of skin lesions? It is the most common type of precancerous lesion. These lesions appear in areas of the body that are often exposed to the sun. The lesions often appear as red or flesh coloured scaly areas. The lesions may look similar to a wart. The lesion will have a dry surface and have a rough texture. Many times you may not be aware of the bump until you notice the scales that appear on it. There is a chance of Actinic Keratosis turning into full-fledged carcinoma. Everyone knows about moles and it is a common occurrence. Most of these moles are benign skin growths and harmless. But some of these moles can potentially develop into cancer over a period of time. If you have moles on your skin and they are changing colour, have an uneven border or becomes very large, you should immediately consult your dermatologist. The more moles you have there is a chance that one or more may develop into skin cancer. This is similar to Acitinic Keratosis but instead of the body skin the scaly patches will appear on the lips. The lips will constantly feel cracked and chapped with small dry and scaly patches. The lips may also swell and show more defined lines. If some scaling and swelling is seen on the lips it is time that you consulted a dermatologist without fail. Those who develop cutaneous horns on their skin should be vary, because these can develop into cancer. The person with cutaneous horms has a higher risk of developing cancer. The horns occur most commonly in elderly people and those with fair skin. What are the treatments for skin lesions? Your doctor will decide whether your precancerous lesion requires immediate treatment or not. Usually the doctor will suggest removal of these lesions to minimise the risk of cancer developing. The removal can be through surgery using cryosurgery method or freezing method, excision, electro cautery or laser surgery etc. depending on the type of lesion. Sometimes doctors will conduct a biopsy of the removed lesion to find out if it is carcinogenic.